For the first outing of the season I decided to come to Flaine. The resort is not yet opened; it should open on the 15th of december. So, it was a good option to come there to test my new splitboard. They already started to spread artificial snow meaning it will be less dangerous for my new Lib Tech. It was 9:40 when I arrived at Flaine's parking. The temperature was -10°C and I had to restart the car for a while to warm up after having finished preparing all the stuff. 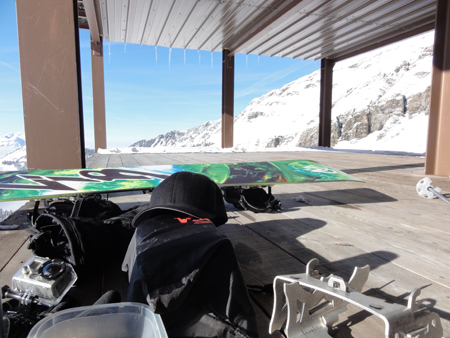 My first steps with the Lib Tech splitboard and Karakoram bindings in touring mode were made at 10:00. The stuff was working like a charm and I was a lot faster than last year with my snowshoes. It took me less than 45 minutes to reach 2000m. 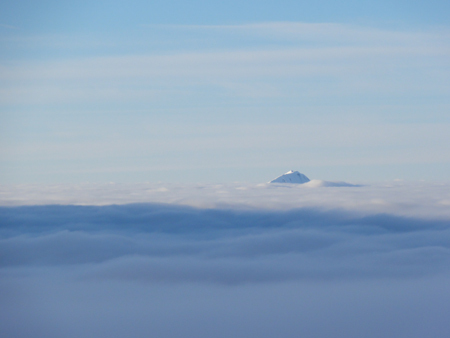 The weather was beautiful and I felt so lucky being above this ocean of fog. 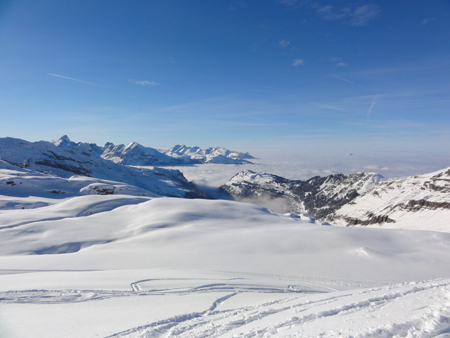 Below 2000m there was only 15-20cm of soft snow laying directly on the ground without any base. From 2000m the snow depth was safer. I was not alone for my first outing but it was for sure less crowdy than it will be in 15 days when the resort will open. I know this resort very well but it was the first time I got there without a skipass. I made my first snowboard curves in Flaine when I was 14 years old and now I was making my first splitboard experience 20 years later. 40 minutes later I arrived at the footer of Tête Pelouse and after a quick look at the Mont Blanc I started switching my stuff to ride mode. I didn't have any problem but it took me around 10 minutes to pack everything and be ready to shred the mountain. 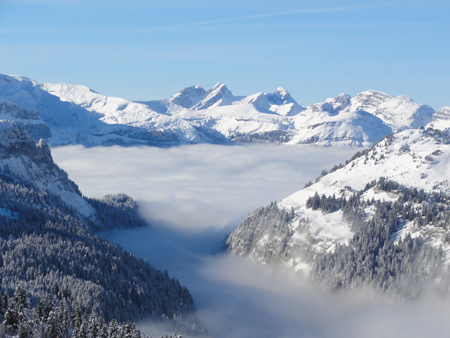 On the picture above we can see the Desert de Platé and the Mont Blanc a little bit hidden by clouds. The Tête du Colonney and the Pointe Percée appear on the left of the picture below. I stopped at 2000m and met friends who started sooner. We shared our happiness for a while. It was time to eat and I decided to stop at the restaurant the Blanchot (1950m). After a good lunch I switched back to tour mode and start hiking again for another run. I reach the summit 40 minutes later. Then I walked on the ridge of Tête Pelouse to reach a steeper face. Short face but the snow was perfect and this second run was amazing!!! 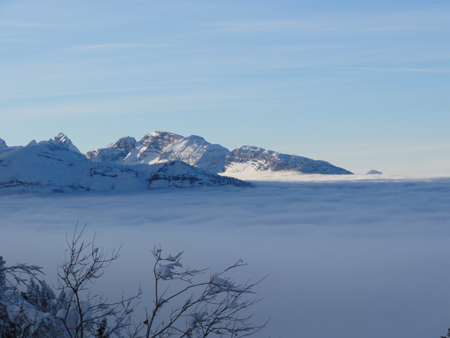 It was time to drive back to Geneva and to dive in the fog again... on the right the Môle is floating.